The CO Analyzer is designed for many demanding applications including trace-gas (air quality) monitoring, eddy-correlation flux measurements, chamber flux measurements, and combustion diagnostics. The Analyzer is particularly well suited for measurements in the field and has been successfully deployed on-board aircraft for measurements in the upper troposphere / lower stratosphere. The CO Analyzer is unaffected by other atmospheric gases or changes in atmospheric pressure. The CO Analyzer uses LGR’s patented Off-axis ICOS technology, the fourth-generation cavity enhanced absorption technique, which employs a high-finesse optical cavity as the measurement cell. LGR’s technology has many proven advantages over conventional first-generation cavity ringdown spectroscopy (CRDS) techniques. In brief, since the laser beam does not have to be resonantly coupled to the measurement cell (i.e. precise beam alignment is not critical), LGR Analyzers are relatively inexpensive, simple to build, and inherently robust thermally and mechanically. 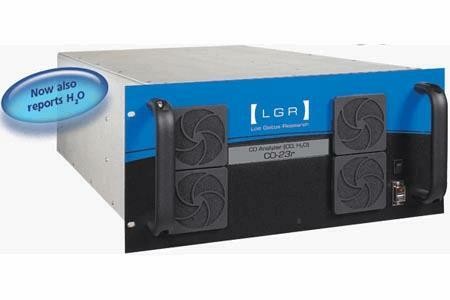 In addition, since LGR’s technology can record reliable absorption spectra over a far wider range of optical depths (absorbance values) compared with CRDS, LGR Analyzers provide measurements over a much wider range of mixing ratios (gas concentrations). Finally, due to the ease and simplicity of recording and quantifying the measured spectra using LGR’s Off-Axis ICOS, LGR Analyzers display the entire absorption spectra to the user in real time allowing for immediate system diagnostics and comprehensive performance validation. The CO Analyzer is now available in LGR’s new “Enhanced Performance" packaging, which incorporates proprietary internal thermal control for ultra-stable measurements with unsurpassed precision, accuracy, linearity, stability and drift. For applications requiring highly mobile measurements in the field, LGR offers the CO Analyzer (and N2O/CO Analyzer) in our acclaimed portable package. Moreover, only LGR’s analyzers provide reliable measurements (guaranteed) at concentrations more than 20 times greater than typical ambient levels. Furthermore, LGR's Analyzers report measurements over the widest range of ambient temperatures allowing users to easily record reliable data in the field. The CO Analyzer includes an internal computer (Linux OS) that can store data practically indefinitely on its internal hard drive (for applications requiring unattended longer term operation), and send real-time data to a data logger through its analog and digital (RS232) outputs. In addition, the availability of many value-added options extends the abilities of the unit to include measurements of discrete samples (collected in bags or vials, for example) and to automatically handle multiple inlet sources (e.g., from flux towers or distributed sites) for uninterrupted measurements over periods of weeks. As with all LGR analyzers, the CO Analyzer may be controlled remotely via the Internet. This capability allows the user to operate the analyzer using a web browser practically anywhere Internet access is available. Furthermore, remote access allows full bios-level control of the instrument and provides the opportunity to obtain and share data and to diagnose the instrument operation without being on site.